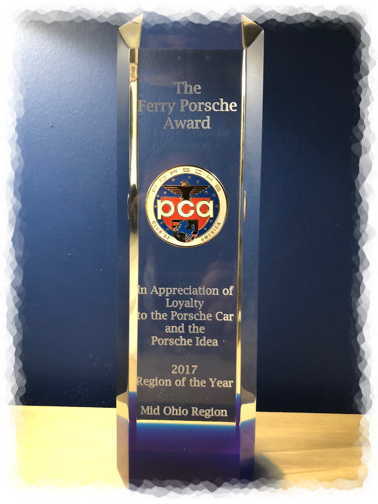 In 2018 the Mid-Ohio Region was awarded by PCA National the 2017 Region of the Year! Selected by the Elected Board. Selected by the current President. The membership of the club determines who will be the recipient of the Christine Zombek Award by indicating on their Annual Board Election ballots who they feel exemplifies the meaning and spirit of being a true enthusiast. The award is named after Christine Zombek, who transferred to MOR from the Allegheny Region. Christine was the driving force behind MOR’s establishment of our charitable giving program and encouraging our members to get personally involved in our community. MOR established this award to honor Christine and her enthusiasm as an example to others to continue with their passion, whatever it may be, in the face of adversity. She was the first recipient of the award in 1996 and presented it in 1997 shortly before her passing. Selected by the Driver education Committee.